All shark fin will be off the menu as of January 1, 2012, but the company has said it will honor any banquet bookings with shark fin product made before November 21. “By removing shark fin from our menus, we hope that our decision can contribute to preserving the marine ecosystem for the world’s future generations.” said CEO Clement Kwok. As Asia’s oldest hotel company, currently operating nine Peninsula hotels in Hong Kong, shanghai, Tokyo, Beijing and New York, the move to ban shark fin is sure to encourage other companies to take similar measures. Last year, the WWF launched an Alternative Shark-Free Menu Campaign, targeted at persuading Hong Kong restaurants to remove shark fin from their banquet menus and offer alternatives. There are several other organizations who have also removed shark fin soup from their menus in response to the WWF campaign. A full list is available here. 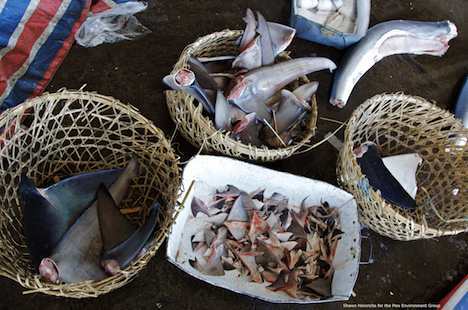 As we’ve reported recently, shark finning is disturbingly brutal and is happening on an astonishingly large scale. Do you think this will help spark a global trend in the removal of shark fin from restaurant menus? Hat tip to Greg Cornelius for the news. I remember first hearing about this in the 90’s. Practiced for centuries, this is a battle between conservation and culture. Education is a paramount in turning this around. I suspect that given it’s a part of traditional values, the message to educate needs to speak to those at a values level too. Keen to hear from those who understand the difference between needs and values based messaging…. what do you think? I a way, it’s similar to the struggle to have whale hunting banned over the past few decades. Shark finning has really become an issue because it’s carried out at unsustainable levels. It’s being done on an industrial scale.